<1>Raymond Williams, The Country and the City (London: Chatto & Windus, 1973), 35–6. <2>Cecil J. Sharp, English Folk-Song: Some Conclusions (London: Simpkin & Co., 1907), 135–6. <3>Dave Harker, Fakesong: The Manufacture of British “Folksong”, 1700 to the Present Day (Milton Keynes: Open University Press, 1985), 175. <4>Zeev Sternhell, Neither Right nor Left: Fascist Ideology in France, translated by David Maisel (Berkeley: University of California Press, 1986), 272. <5>Zeev Sternhell with Mario Sznajder and Maia Asheri, The Birth of Fascist Ideology: From Cultural Rebellion to Political Revolution, translated by David Maisel (Princeton, NJ: Princeton University Press, 1994), 3. <6>Notable exceptions include Georgina Boyes, The Imagined Village: Culture, Ideology and the English Folk Revival (Manchester: Manchester University Press, 1993) and Daniel J. Walkowitz, City Folk: English Country Dance and the Politics of the Folk in Modern America (New York: New York University Press, 2010). Ross Cole is a Junior Research Fellow in music at the University of Cambridge. Apple’s June 5, 2017 Worldwide Developer’s Conference (WWDC) keynote presentation was, by many measures, a fairly standard, very polished Apple production, full of the usual slick visuals and catch-phrase styled language that reflects the company’s famous, tightly controlled image. 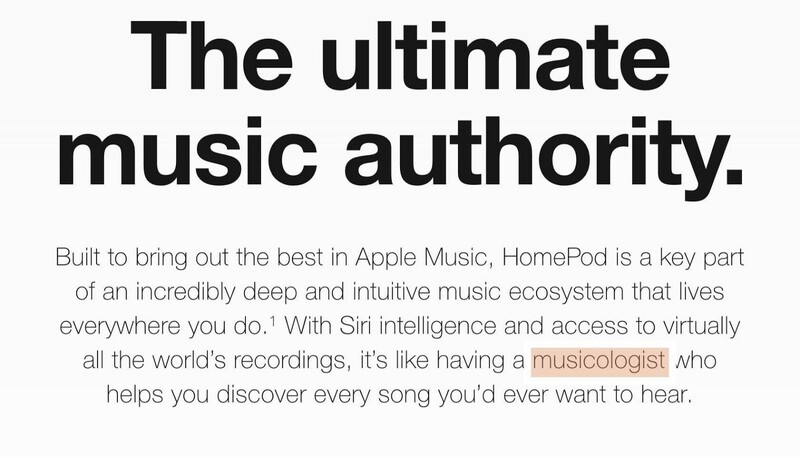 Toward the end of the keynote, CEO Tim Cook brought Senior Vice President of Worldwide Marketing, Phil Schiller, to the stage to launch an announcement of Apple’s latest product, the HomePod, a product Schiller positioned primarily for listening to music. Amidst his delivery of Apple-typical claims of reshaping the world, Schiller enumerated three key innovations of the product: 1. high quality speakers; 2. adaptive spatial acoustic functions; and 3. a musicologist. #HomePods‬. Apple comes with such cool or strange Names !! Jacob Daniels (@senatordaniels), June 5, 2017: Siri is not a musicologist. 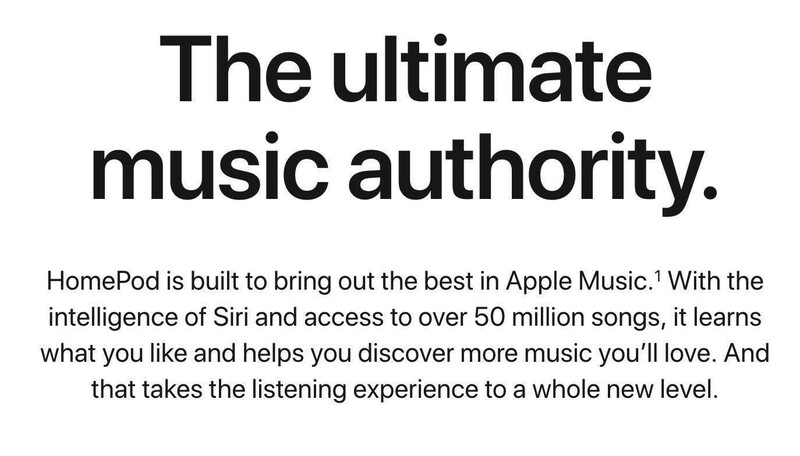 As many recalled at both the WWDC and release date announcements, however, this was not the first time a music streaming service had adopted the term “musicologist” to address the limitations of algorithm driven music recommendations. Pandora Radio has long employed a team of curators it calls “musicologists” for its Music Genome Project whose goal is effectively to develop stronger metadata for the platform’s algorithms, which select music that “fits” together for automated, personalized radio stations. In September 2012, Nokia introduced an ill-fated streaming service for the similarly ill-fated Windows Phone, where “consumers [could] stream music from a suite of over 150 exclusive playlists that are curated and kept up to date by an expert team of US based musicologists.” And in 2014, Warner Music Group’s music cataloguing and marketing arm, Rhino, issued a call for the individual user to “become a Rhino musicologist,” and “share their superior musical taste with the world,” in the form of playlists submitted via its application within Spotify. In method, Pandora tends more toward machine learning, with a distinctly individual-centered and ephemeral result, while Nokia and Rhino leaned more toward human, static outcomes. And in procedure, Rhino’s crowd-sourced method acts as a foil to the in-house approaches of both Pandora and Nokia. 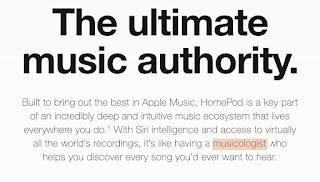 By the time Apple announced its HomePod, ample precedent had been set for “musicologists” in the music streaming industry, even as there remains conceptual ambiguity in individual idiosyncratic usages of the term by different companies. Still, there are some overarching implications in these usages beyond pretenses of neologism or rebranding established practices. To twist the earlier question toward historical terms: why can the word “musicologist” do any work in this situation, at all? What basis is there for marketing teams at these companies choosing it in the first place? When a Google product designer, Nick Materese, tweeted this concatenation on the morning after Apple’s WWDC announcement, he gestured toward a possible interpretation of Silicon Valley’s adoption of a term that seems superficially pretty foreign to the tech industry. Matarese humanizes Siri qua musicologist in her HomePod morph by characterizing her as T-shaped, capable of many things with deep specialization in one. The description is apt, especially accounting for the other functions she performs, but rather than cast Siri as a startup team member, as “T-shaped” connotes, I would suggest that Materese’s reference to generalists invokes, intentionally or not, a historical context of yearning for guiding lights and experts amongst wider publics. Among figures like Will Durant, John Erskine, Stuart Pratt Sherman and Irita Van Doren that Rubin describes, Henry Seidel Canby supplies us with an interesting and demonstrative case. 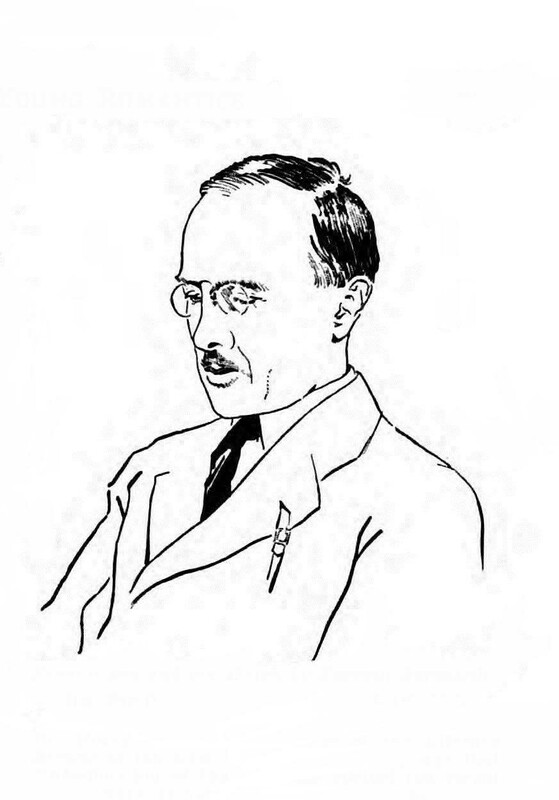 Canby’s origins and education align him closely to genteel generalism as he progressed through studies at Yale, eventually earning a PhD in 1905 and a faculty position there in 1908. Becoming restless with materialism’s specializing influence on curricula at Yale as students sought well-paying jobs over well-roundedness, he eventually left the academy and became editor of Literary Review for the New York Evening Post, a publication intended to inform its audience’s reading choices. Before long, he landed on the Board of Judges for Harry Scherman’s Book of the Month Club, founded in 1926.<3> Canby’s Ivy League pedigree and personal intellectual philosophy made him well-suited to serve as a guiding light before a wider public, part and parcel of an industry partially reliant on this sort of personality for its legitimation. Closely resembling these printed products, educational entertainment also appeared on the radio in the 1920s and 30s, with programming featuring an intellectual guide leading discussions or lectures on classic or contemporary literature. Eventually, universities supported radio lectures by their professors, in a role akin to the work of today’s university extension course lecturers. In products legitimized by professorial experts like Canby, what buyers purchased was as much the opinions of the experts as it was the Book of the Month. What I want to spotlight here about the figure of Henry Canby and middlebrow products is the strong customer appeal of the guiding expert. Products like the Book of the Month and radio lectures by university experts took shape from a demand for cultural cache, not unlike human or algorithmic curators of streaming music playlists and radio stations. While tech companies’ adoption of the term “musicologist” came as a jolt of humility to those of us who lay claim to that title professionally, offering a patina of expertise and pre-packaged access to elite culture is the actual work that the word “musicologist” does for Pandora, Apple and others. This resonance with historical middlebrow products, I would argue, is a primary reason the term carries any significance at all. Consumers buying legitimacy buy the supposed privilege of being in the know, much like the connoisseur outlets of Pitchfork or Fanfare Magazine. Taking a step back, applying the term “musicologist” to a digital assistant puts the face of an expert on the thing; more simply, it puts a face on a thing, humanizing and warming it. It seeks to resolve a problem that in March of 2018 Washington Post pop music critic, Chris Richards, saw in platforms like Spotify, where “algorithm-generated playlists often feel like mix tapes made by bots,” which they are. The appeal of humanity explains why, when devising the Book of the Month, Harry Scherman’s decision to cultivate images of personalities to sell his products rather than curate a faceless catalog listing worked as well as it did. Humanization sells. While streaming services’ adoption of expert “musicologists” puts consumers in the know, it also contributes to platforms’ generation of communities. Generally speaking, individuals who follow an expert (middlebrow or other) form a virtual community akin to Benedict Anderson’s imagined communities, where readers gather in common consumption of literature, or slightly adapted, follow the ideas of an expert.<5> In the case of music streaming, literature can be substituted by playlists, which can be curated by “musicologists” (experts). Spotify, as a prominent example, plainly exhibits other markers of community, as well: if they choose, users register by linking a social media account, subsequently follow their contacts’ activities, and even make collaborative playlists with them. Other features generate not only communities, but what can be termed publics. Literary critic Michael Warner, in his influential essay, “Publics and Counterpublics,” gives a number of criteria required for an entity to garner the status, “public.” Most significantly, Warner revises the all-encompassing and much-critiqued formulation of “the” public from Jürgen Habermas’s The Structural Transformation of the Public Sphere into a nimbler, more flexible configuration of multiple publics. His criteria for whether an entity is “a” public include: 1) self-organization, 2) a relation of strangers, and 3) constitution through mere attention.<6> Determining whether music streaming users constitute a public, individuals voluntarily become users, qualifying them as self-organized. Linking to one’s Facebook friends on the platform could disqualify certain regions of Spotify from being a public, per Warner, but users can subscribe to and consume Spotify’s algorithm/musicologist-curated playlists. Such subscriber groups bring together individuals who otherwise would not know one another, creating relations between strangers. Though Warner thinks primarily of written media in his prerequisite of “mere attention” (that is, multiple strangers’ simultaneous consumption of the same piece of writing), sociologist Georgina Born cites Benedict Anderson in positing that music performs the same function: “Music animates imagined communities, aggregating its listeners into virtual collectivities or publics based on musical and other identifications.” Music streaming services do similar work to the online piracy communities Born elsewhere references as facilitating “the virtual or stranger alliances and collectivities generated by the mediation circulation of music and sound.”<8> If these parallels work only as implied evidence of the virtual communities to which streaming services’ “experts” contribute, to a self-consciously literal, nominal extreme, there is even a message board, the Spotify Community, which fulfills one other of Warner’s rules for “a” public: ongoing, reflexive discourse. Surfing alongside all of this is the “musicologist,” with its expertise and curated playlists. Lest we dismiss these elements as menial or incidental, the proliferation of black markets for playlists shows that there is big business in fostering a healthy community or public, whether in music streaming or in middlebrow cultural products. Realistically, all of these communal features are profit-minded, exploiting the dopamine-inducing potential at the heart of social media’s allure. Nevertheless, each contributes some element of community or public. In reflecting upon what music streaming services do when they adopt a term like “musicologist,” parsing the user experience gives significant insight into why the fictional figure of the music streaming musicologist has any impact, at all. Just as the Book of the Month and university-supported radio programming catalyzed middlebrow publics, music streaming services are the platforms for their publics, to be legitimized and partly constituted by the likes of a Canby or Siri-musicologist. To paraphrase another public intellectual, Leonard Bernstein: whither “musicologist”? If a behemoth like Apple has forgone the word for one reason or another, it is difficult to guess if or how the word will surface again. But in this case, what may have felt to some critics like a naive co-opting of a term was actually a shrewd marketing decision connected to history, and for Apple is right at home with the Smart Keyboard, Genius Bar, and myriad Pro models meant to make customers feel in the know. <1>Joan Shelley Rubin, The Making of Middlebrow Culture (Chapel Hill: University of North Carolina Press, 1992). <4>Norman Borachardt, “Sketch of Henry Seidel Canby,” Current Opinion 72 (January-June 1922), 381. <5>Benedict Anderson, Imagined Communities (New York: Verso, 2006). <6>Michael Warner, “Publics and Counterpublics,” in Publics and Counterpublics (New York: Zone Books, 2005), 65-124. <7>Georgina Born, “Introduction - music, sound and space: transformations of public and private experience,” in Music, Sound and Space (Cambridge: Cambridge University Press, 2013), 32. Jacques Dupuis is a PhD candidate in historical musicology at Brandeis University, writing a dissertation on Robert Schumann and early 19th-century popular theater genres. Title-piece from an opera libretto printed in Lyon in 1706. Photo: Natasha Roule. From the author’s collection. In 2015, Canal+ aired the first episode of Versailles, a Franco-Canadian television series about the young Louis XIV and his efforts to consolidate political power. As the title of the series suggests, Versailles centers its plot around the luxe chateau that the Sun King built on the site of his father’s favorite hunting lodge some 50 miles southwest of Paris. A dramatized historical fiction, the series draws from the vast historiographical literature that explores how Louis XIV cultivated his power from the seat of Versailles. Yet as the king worked to centralize the French government, he had to contend with a large kingdom beyond Versailles – a kingdom characterized by political and cultural heterogeneity that occasionally posed challenges to the king’s absolutist measures. Indeed, the political centralization of France under Louis XIV was a tricky affair: far from simply demanding that legislature be put into effect in each province, the king and his ministers engaged in a game of compromise, negotiation, and sometimes coercion with city magistrates and provincial governors. Though the history of absolutism in French cities has received some study by historians, we can gain a deeper understanding of the implementation and reception of absolutism in provincial France by approaching the subject from a musicological perspective.<1> To do this, the tragédie en musique – the absolutist genre par excellence – is key. 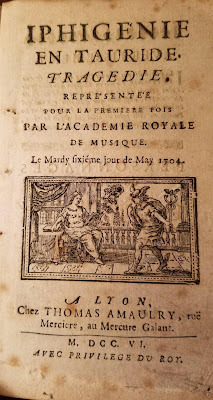 In my dissertation, “The Operas of Jean-Baptiste Lully and the Negotiation of Absolutism in the French Provinces, 1685-1750,” I explore the performance history of Lully’s tragédies en musique in four French cities: Marseille, Lyon, Rennes, and Strasbourg. I argue that productions of Lully’s operas in these cities played a major role in the expansion of absolutism even as they functioned as mouthpieces of provincial pushback against the Crown. On the one hand, Lully’s tragédies acted as vehicles of absolutist propaganda, lending mobility to the king’s image as an absolutist monarch in much the same way as the equestrian statues of Louis XIV that were erected in major cities throughout France.<2> At the same time, many provincial artists altered or satirized Lully’s tragédies, deliberately keying their modifications to critique royal intervention in local affairs. Beyond teasing out political struggles over absolutism in provincial opera productions, my dissertation also traces changes that provincial artists made to Lully’s libretti and scores. Opera performances in Lyon are the most richly documented of all provincial Lully productions, thanks to individuals such as Nicolas Bergiron (1690-1768), who curated the performance scores used by the Lyon Académie des Beaux-Arts, a semi-amateur music society. From these scores, we learn, for instance, that Lyonnais musicians did not hesitate to rewrite Lully’s continuo lines or shrink his expansive choruses into less time-consuming affairs. Such changes underscore not so much the mutability of the tragédies, but their locality – that is, how the operas were local phenomena that adapted fluidly to local ideas and tastes. By exploring the locality of Lully’s tragédies, we expand the network of actors involved in the performance history of this repertoire to encompass singers, directors, and printers who operated beyond Paris, as well as government officials whose ideologies might have influenced the production of an opera. We also push issues of performance to the center, especially in instances where it might seem difficult or impossible to talk about the music: even though the scores of most provincial productions of Lully’s operas have been lost, there are clues in provincial libretti for alterations to Lully’s scores that diverged from how the repertoire was performed in Paris. The canonic narrative of French baroque opera – at least the narrative that we tend to teach in the classroom – often overlooks the locality of the tragédie en musique. We tend to imagine early French opera as a genre that was as rigidly centralized as the absolutist regime of the Sun King. By taking provincial productions of Lully’s operas into account, we gain a clearer understanding of how politics shaped opera – and vice versa – beyond Versailles in Old Regime France. <1>Several historical studies have been particularly influential to my understanding of absolutism as a process of compromise and negotiation during the reign of Louis XIV. These include Roland Mousnier, La vénalité des offices sous Henri IV et Louis XIII (Rouen: Éditions Maugard, 1945); William Beik, Absolutism and Society in Seventeenth-Century France: State Power and Provincial Aristocracy in the Languedoc (Cambridge, UK: Cambridge University Press, 1985); and Junko Thérèse Takeda, Between Crown and Commerce: Marseille and the Early Modern Mediterranean (Baltimore, MD: The Johns Hopkins University Press, 2011). <2>For further details on absolutist propaganda under Louis XIV, see esp. Peter Burke, The Fabrication of Louis XIV (New Haven: Yale University Press, 1992). <3>For a concise reading of the politics of Quinault’s libretti, see esp. Buford Norman, Touched by the Graces: the Libretti of Philippe Quinault in the Context of French Classicism (Birmingham, AL: Summa Publications, 2001). <4>For an overview of Lully’s monopoly, see Caroline Wood, French Baroque Opera: A Reader (Burlington, VT: Ashgate, 2000), 6; 8. <5>For a chronology of performances of Lully’s operas outside of Paris, see Carl Schmidt, “The Geographical Spread of Lully’s Operas during the Late Seventeenth and Early Eighteenth Centuries: New Evidence from the Livrets,” in Jean-Baptiste Lully and the French Baroque: Essays in Honor of James R. Anthony, ed. John Hajdu Heyer (Cambridge; New York: Cambridge University Press, 1989), 183-211. <6>Pierre Gautier, Le Triomphe de la Paix (Lyon: Thomas Amaulry, 1691); Gautier and Balthazar de Bonnecors, Le Jugement du Soleil. Mis en Musique (Marseille: Pierre Mesnier, 1687). 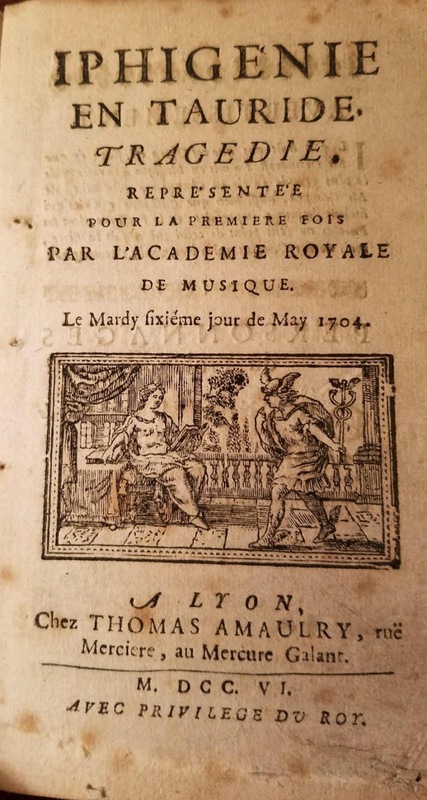 <7>Marc Antoine Legrand, La Chûte de Phaëton, comédie en musique (Lyon: Thomas Amaulry, Hilaire Baritel, Jacques Guerrier, 1694). <8>Jean-Baptiste Lully, Philippe Quinault, and Pascal Collasse, Atys, tragédie en cinq actes, avec un prologue mis en musique par M. Collasse, représentée à Vitré devant MM. des États de Bretagne, en 1689 (Paris: C. Ballard, 1689). <9>See, for example, Lully and Quinault, Isis (Strasbourg: Jean-François Le Roux, 1732). Natasha Roule received her PhD in historical musicology from Harvard University in May 2018, where she was supported by a Mellon/ACLS Dissertation Completion Fellowship and an American Graduate Fellowship from the Council of Independent Studies. The media did not share this preoccupation, but it did obsess over the political meanings of the event. Although he was not present (in accordance with McCain’s wishes) and his name was not uttered at the actual service, President Donald Trump’s presence loomed large, if only in the form of an unseen foil to emphasize McCain’s public persona of humble heroism. The senator’s friend, John F. Lehman Jr., did not believe the funeral arrangements were directed at Trump. But he added, “Trump was definitely a catalyst to get [McCain] focused on pushing those symbolic issues.’”<2> Others agreed with this assertion, referring to the event as a “resistance meeting,” an “exercise in civic communication,” a “funeral for the loss of American ideals,” and “a two-and-a-half hour rebuke of Trump.”<3> Might the symbolism Lehman (and others) have noted extend to the music programme the candidate curated for his final farewell? If so, what meaning might such a programme hold for a nation as it comes together to mourn an American hero against the backdrop of a fractious political landscape? Before the service of McCain’s funeral began, organ music played as attendees gathered and greeted one another. The selections were a mix of hymns and classical music transcriptions—Handel’s Largo from Xerxes, Tchaikovsky’s Andante cantabile from the Symphony No. 5, and Elgar’s “Nimrod” from the Enigma Variations, among others. Comforting and familiar, these works not only infused the National Cathedral with solemnity and pathos, but also functioned effectively as background music for the attendees. And yet, one might wonder if the selection of “Simple Gifts” caught anyone’s attention. Perhaps not—the music is, like many of these selections, familiar and it easily fits with both genres employed, being a religious Shaker melody adapted for Christian worship and playing a prominent role in Aaron Copland’s iconic Appalachian Spring. But then again, perhaps it did. Unlike most of the other works played before the service, this melody has a nationalistic sentiment woven into its history. Indeed, it foreshadowed the overtly patriotic music performed as part of the service, and called attention to the political functions of the ceremony. Following Copland’s use of the tune, “Simple Gifts” grew in popularity as both a folksong and a religious hymn. Roger Lee Hall comments that, as a Shaker song, the music and lyrics stress two key principles of the Shaker Faith: simplicity and unity.<9> While these ideals fueled its prevalence with the folk revival, and by extension leftist communitarian politics, simplicity and unity also seem apt in the context of John McCain. His public persona revolved around his trademark “straight-talk” and policies like campaign finance reform, both emphasizing a straightforward simplicity in his politicking, while his bipartisan work touted a desire for political unity across the aisle.<10> By the 1970s, the hymn had also entered the mainstream of Christian music as “The Lord of the Dance,” with new lyrics written by English poet Sydney Carter in 1963. 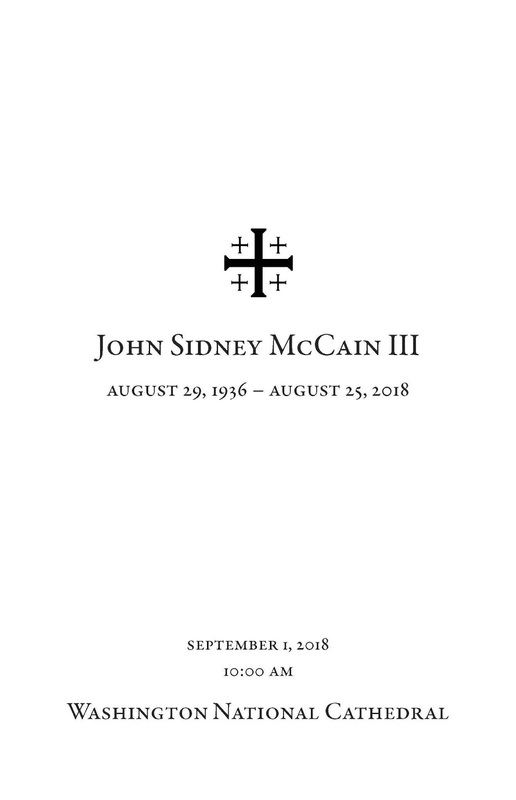 The music’s dual nationalistic and religious nature speaks not only to its suitability for a state funeral, but also perhaps hints at the frequent intersection of Christian religion and politics in McCain’s own Republican party. As a work of Americana, “Simple Gifts” has been performed at presidential inaugurations, including those for Ronald Reagan and Bill Clinton. Most recently and most conspicuously, the melody was heard at Obama’s presidential inauguration in 2009, where composer John Williams premiered a set of variations on “Simple Gifts.” In a rather tepid review of the piece, Washington Post critic Anne Midgette called the work “functional, representational music” that “allowed everyone some downtime before the main event of the oath and the new president's speech. For although it was only four minutes long, a lot of people stopped paying attention and started talking to each other before the music was over.”<11> But the choice of the tune at Obama’s inauguration may have entailed more complex symbolism than was perhaps recognized that day. In discussing the use of Aaron Copland’s music in Spike Lee’s film He Got Game, for example, Krin Gabbard suggests that by scoring black bodies with Copland’s Americana music, “Lee may be asserting that these African Americans [sic] youths are as uniquely and thoroughly American as anything that Copland’s ballet music might signify.”<12> Performing “Simple Gifts” at Obama’s inauguration achieved a similar effect, persuasively arguing for the Americanness of a black President whose birth certificate was questioned. After McCain’s death, one video that circulated showed McCain standing up to voters who claimed Barack Obama was Muslim and not American.<13> In this video, McCain performed similar political work as Copland’s music by arguing for the Americanness of his electoral rival. The inclusion of “Simple Gifts” at McCain’s funeral was perhaps similarly symbolic. In light of the music’s connection to Obama’s inauguration, coupled with McCain’s own decision to have President Obama speak at the funeral, the service gestured openly to McCain’s persona as a bipartisan and generous politician. Moreover, the music’s ability to layer identity, from sacred to secular, from Shaker to Protestant, from wartime to peacetime icon, matches McCain’s own mercurial and unpredictable political nature over a long career of service. For many, McCain’s political career may have been a gift, but it was far from simple. There are certain musical staples of patriotic events in the United States: “The Star-Spangled Banner,” “My Country, tis of Thee,” “America the Beautiful,” and many, many others. These events commemorate beginnings and endings, and range from somber to celebratory, which means that the music must evoke multiple moods and ideas. Patriotism, after all, encompasses a multifaceted matrix of signs and signifiers. One successful amalgamation of patriotic signifiers is Peter Wilhousky’s 1944 arrangement of Julia Ward Howe and William Steffe’s “Battle Hymn of the Republic,” as orchestrated by Phil Snedecor. The arrangement incorporates a range of patriotic ideas, such that the context of the performance can change or nuance its meaning. A comparison between the arrangement’s performance at President Trump’s inauguration festivities in January 2017 and Senator McCain’s funeral in September 2018 demonstrates how context can define musical signals of patriotism. Wilhousky and Snedecor’s arrangement provides a wealth of patriotic references and gestures, from the historical to the martial to the religious. While the original song became popular as a musical representation of the Union during the Civil War, the interjections in the second verse clearly recall “Dixie,” the anthem of the Confederacy. Setting those interjections in the piccolo (as most orchestrators do) recalls the fife-and-drum sounds associated with the Revolution. The opening drum rolls and martial bugle reference the nation’s military might—a point of pride for many citizens. The instrumental verse sounds like a John Philip Sousa march, and hymn-like texture in the third verse speaks to the United States’ historical reliance on a Christian moral framework. However, at McCain’s funeral, the Wilhousky/Snedecor “Battle Hymn,” had slightly different connotations. In this context, the third verse stood out. The hymn-like setting recalled “Eternal Father, Strong to Save” sung earlier in the service, an anthem associated with naval servicemen.<16> Combined with the martial drums and bugle calls in the beginning, the moment served as another reminder of McCain’s military career. The celebratory ending of the Wilhousky/Snedecor arrangement also worked in both contexts, but with different signification. The final cries of “glory, glory, hallelujah” signaled triumph and a new beginning at the inaugural concert, but indicated a heavenly ascent at McCain’s funeral. By weaving together a number of complex sounds and ideas, Wilhousky and Snedecor created a flexible arrangement that avoids sounding bland. Still, despite the myriad themes and ideas this arrangement evokes, its patriotic signifiers may not resonate with all Americans. Although “Battle Hymn” takes its tune from the abolitionist anthem “John Brown’s Body,” this arrangement emphasizes the song’s military pedigree with sounds associated with the predominantly white armies of the Revolutionary and Civil Wars (which is not the case with all arrangements of the song, even from the 1940s). That focus on the eighteenth- and nineteenth-century musical emblems of patriotism also excludes the swaths of citizens whose families arrived in the twentieth- and twenty-first century waves of immigration. And the Christian references in both the lyrics and the music exclude citizens of other or no faith. Even an arrangement as flexible as this has limits. McCain listened to the beloved ballad “Danny Boy” on the porch of his Sedona home while he was battling terminal brain cancer and expressed his wish that it be included in his funeral service to his family. He tapped the critically acclaimed American soprano Renée Fleming for this performance following a suggestion made by his former campaign manager and friend Rick Davis.<17> In the days leading up to the funeral, pundits and politicians pondered the late senator’s choice of musical eulogists, as well as other aspects of his funeral plan--Fleming even appeared on CNN’s Inside Politics where she shared her own thoughts on the role of music in national rituals and the meaning of “Danny Boy. English songwriter and lawyer Frederic Weatherly (1848-1929) penned the words to “Danny Boy” in 1910, the same year he lost both his son and his father (though there is some conjecture over whether the text came before or after these tragic losses). In his memoirs, Piano and Gown (1926), Weatherly credits his sister-in-law with introducing him to “Londonderry Air,” the tune that he eventually paired with his lyrics after reworking them to fit the Irish melody.<18> While the relationship between the song’s narrator and addressee remains ambiguous, and the titular Danny’s destination an enigma, “Londonderry Air” (with “Danny Boy” or other lyrics) has set a somber tone for several high-profile funerals and memorials: Princess Diana’s funeral (as “Air from County Derry” with a text by Howard Arnold Walter; sung by a boy choir); John F. Kennedy’s funeral (as “Londonderry Air” with the text “Above the Hills of Time the Cross Is Gleaming;” sung by the Naval Academy Catholic Choir); and various 9/11 funerals and memorials, including the 2015 memorial in New York City (as “Danny Boy;” performed by flutist Emi Ferguson). Fleming performed lush operatic renderings of “Danny Boy” which in an interview she described as a “nostalgic piece” that she associates with her childhood, at the American Voices Festival concert and she included the song on her album Guilty Pleasures (2013). For the McCain funeral performance Fleming traded lavish orchestration for a more pared down arrangement featuring a string quartet and an accordion, which offered accompaniment in the form of unobtrusive sustained chords, rich with tension-building suspensions in the introduction and interludes. This instrumentation is noteworthy. The string quartet, with its Classical, Western-European roots, carries strong connotations of elitism, gentility, and cultivated taste, while the accordion is more closely aligned with popular, folk, and “ethnic” musics, such as klezmer, Norteño (Mexico) and Cumbia (Colombia). The arrangement begins in C major and then modulates to D major at the interlude between the first and second verses—both keys sitting quite low in the ambitus for a lyric soprano. (In the earlier performances of “Danny Boy” cited above, she chose the much higher key of F.) Fleming uses her belt voice (sometimes with less vibrato) when singing at the bottom of her range and pairs this timbre with vocalisms and phrasing more aligned with musical theatre than opera.<21> When she nears the apex of each verse, the voice seamlessly transitions into the signature, full-blown operatic sound that had made Fleming an international star. The accordion’s judicious sprinkling of grace notes (which mimic the sound of pitch bends) adds a fleeting bluesy sound, while a longer trill salutes the tune’s (and perhaps McCain’s) Irish origins. Like the string quartet-accordion combination, Fleming’s agile shifting between a more musical theatre-esque timbre and an operatic one is notable in that it blurs generic boundaries, and by association, racial, ethnic, and class lines as well. Fleming’s funeral performance and biography, one might argue, would fall in line with the “symbolic” agenda Lehman described. Throughout his career, McCain was branded a maverick, a non-conformist, and a champion of bipartisanship—a trifecta he reasserted when he voted against the repeal of Obamacare on the Senate floor shortly after receiving his diagnosis. Similarly non-conformist, Fleming, through her chameleon-like reinventions from jazz to opera to rock to musical theater, and her crossover collaborations, pushes against the boundaries of what defines an opera diva in the 21st century. A musical microcosm of these reinventions is woven into her performance of “Danny Boy” with its catalogue of diverse generic signifiers and melding of folkish, popular, and high classical-style timbres. Fleming’s recent excursions on the Great White Way, both with Living On Love (2015) and Carousel (2018), and the music theatre-styled singing in parts of “Danny Boy,” align her with mass culture, the vox populi, and perhaps give a nod to the musical’s defining role in the maintenance of American identity.<22> John McCain similarly laid claim to everyman status, and in one interview even presented his lack of musical taste as evidence of this stature.<23> Last, with her “anti-diva” persona and the simplicity of expression that defines her stripped down performance of “Danny Boy,” Fleming becomes the perfect musical counterpart for the plainspoken McCain, who referred to his 2008 campaign bus as the Straight Talk Express. The historical context for “I Vow to Thee, My Country” illuminates the probable rationale for its inclusion in McCain’s funeral service. Around 1910, British diplomat Cecil Spring Rice wrote the poem Urbs Dei that combined patriotic and sacred modes of thought in a hymn to country and faith. Holst set it in 1921 to the tune from “Jupiter,” which in the meantime has come to be known as “Thaxted,” from the village where Holst resided for much of his life. By featuring this selection, McCain’s funeral stands in a long tradition: since 1921 the hymn has been performed at Remembrance Day commemorations throughout the Commonwealth, Princess Diana had it sung at her wedding in 1981 (and it was performed at her funeral in 1997), and it stood on the Order of Service for the funeral of Margaret Thatcher in 2013. While the cleric’s objections may be justified on theological grounds, the text is not exceptional for British patriotic hymnody from the era of the First World War, which had called forth such poems as “For the Fallen” and “In Flanders Fields.” The phrases in “I Vow to Thee, My Country” that call for unquestioning duty and accepting the willing sacrifice of the “dearest and the best” accorded well with McCain’s own views on the relationship between love for country and military service. So the choice of this music was no aggrandizing or satirical gesture on the part of John McCain, but rather one based on traditional values of country and faith. As his final words to the assembly and, indeed, to the viewing world, the hymn is not irrelevant to understanding the man and how he viewed his legacy. As complex as a state funeral can be, matters become even more complicated when it honors a person as multifaceted as John McCain. One aspect of his public persona was curiously absent from the musical soundscape: maverick. Although he specifically requested eulogies from his political opponents, nothing in the musical selections spoke to his penchant for bucking convention or his life outside public service. Instead, the music emphasized only his heroism, religious devotion, simplicity, and patriotism, so that by the end of the service, John McCain the myth had washed away John McCain the man. His complex legacy on military intervention and civil rights appeared inconsequential in light of the grandeur of the event. Little of the music spoke to his “mischievous” sense of humor (according to Barack Obama), or his love of ABBA.<24> In other words, the details that made him human rather than the larger-than-life figure he became were absent from the service. Just as the funeral only emphasized a few aspects of McCain’s complex life, the music only represented a very small part of John McCain’s America. The musical selections at this state funeral reflected the idea that “The America of John McCain has no need to be made great again because America was always great.” And indeed, the funeral was suffused with sounds from America’s heroic past: military brass bands, simple folk songs, and solemn hymns. The impression was of a heroic (yet humble), white, Christian man representing a heroic (yet humble), white, Christian nation. Still, neither America nor John McCain can be reduced to such simple, overarching concepts. McCain represented the diverse state of Arizona, along with an America that was always more than just our military, our majority ethnicity, and our majority religion. Funerals are myth-making opportunities, and the musical stories we tell ourselves about our past inevitably shape our future. Hopefully, McCain’s (and the country’s) complexities will endure beyond the service. <1> Michael D. Shear and Katie Rogers, “How McCain Got the Last Word Against Trump,” New York Times, August 28, 2018, https://www.nytimes.com/2018/08/29/us/politics/mccain-funeral-trump.html. <3> See Susan Glasser, “John McCain’s Funeral Was the Biggest Resistance Meeting Yet,” The New Yorker, September 1, 2018, https://www.newyorker.com/news/letter-from-trumps-washington/john-mccains-funeral-was-the-biggest-resistance-meeting-yet; Martie Sirois, “John McCain Died, But America May Have Been Reborn,” The Medium, September 2, 2018, https://medium.com/@martiesirois/john-mccain-died-but-america-may-have-been-reborn-17a4766e144f; and Courtney Weaver, “McCain Funeral Delivers a Two-and-a-half Hour Rebuke of Trump,” Financial Times, September 1, 2018, https://www.ft.com/content/be1d8bc6-ae16-11e8-8d14-6f049d06439c. <5> Roger Lee Hall, “‘Simple Gifts’: The Discovery and Popularity of a Shaker Dance Song,” Communal Societies 36, no. 2 (2016): 108. <6> Annegret Fauser, Sounds of War: Music in the United States during World War II (New York: Oxford University Press, 2013), 150. See also Chapter Four of Fauser, Aaron Copland’s Appalachian Spring (New York: Oxford University Press, 2017). <7> “Copland and the American Sound,” Public Broadcasting System, http://www.pbs.org/keepingscore/copland-american-sound.html (accessed December 3, 2018). <8> “Read: Sen. John McCain’s Farewell Statement,” Cable News Network, last modified August 27, 2018, https://www.cnn.com/2018/08/27/politics/john-mccain-farewell-statement/index.html. <9> Hall, “Simple Gifts,” 100. <10> For a more thorough look at how McCain’s bipartisan, “maverick” record evolved over time, see Clare Malone, “John McCain Was A Maverick—And A Politician,” FiveThirtyEight, August 25, 2018, https://fivethirtyeight.com/features/john-mccain-was-a-maverick-and-a-politician. <11> Anne Midgette, “Music Review: John Williams’s ‘Air and Simple Gifts’ at the Obama Inauguration,” Washington Post, January 21, 2009, http://www.washingtonpost.com/wp-dyn/content/article/2009/01/20/AR2009012003560.html. <12> Krin Gabbard, “Race and Reappropriation: Spike Lee Meets Aaron Copland,” American Music 18, no. 4 (2000): 372. <13> Emily Stewart, “Watch John McCain Defend Barack Obama Against a Racist Voter in 2008,” Vox, last updated September 1, 2018, https://www.vox.com/policy-and-politics/2018/8/25/17782572/john-mccain-barack-obama-statement-2008-video. <14> See for example Ashley Parker and Matthew Rosenberg, “Donald Trump Vows to Bolster Nation’s Military Capacities,” New York Times, September 7, 2016, https://www.nytimes.com/2016/09/08/us/politics/donald-trump-speech.html. <15> “Transcript: Donald Trump’s Victory Speech,” New York Times, November 9, 2016, https://www.nytimes.com/2016/11/10/us/politics/trump-speech-transcript.html?_r=0. <16> “The Navy Hymn: Eternal Father Strong to Save,” Naval History and Heritage Command, https://www.history.navy.mil/content/history/nhhc/browse-by-topic/heritage/customs-and-traditions/the-navy-hymn1.html. <17> Dana Bash, “Opera's Renee Fleming 'Touched' to be Singing ‘Danny Boy’ at John McCain's Funeral,” CNN, August 31, 2018, https://www.cnn.com/2018/08/31/politics/john-mccain-funeral-renee-fleming-danny-boy/index.html. <18> Anthony Mann, In Sunshine and in Shadow: The Family Story of Danny Boy, www.lulu.com, 2013. This book was written by Weatherly’s great-grandson, but it is self-published, and from what I can tell, some of the details are contradicted in other sources. This source may not be wholly reliable. <19> For example, Fleming spearheaded the American Voices Festival (2013), which brought singers representing the genres of pop, country, jazz, gospel, broadway, and classical song together for a series of workshops, masterclasses and a performance at the Kennedy Center. <20> Charles McGrath, “The Diva Departs: Renée Fleming’s Farewell to Opera,” New York Times, April 5, 2017, https://www.nytimes.com/2017/04/05/arts/music/the-diva-departs-renee-flemings-farewell-to-opera.html. <21> From its beginnings on Broadway to the present, belting has been associated with the communication of strong emotion. The actual physical characteristics of “belting” are somewhat contested among vocal pedagogues, but suffice to say for our purposes here, the belt sound is distinct from classical singing. See Christianne Knauer Roll, “Female Musical Theatre Belting in the 21st Century: A Study of the Pedagogy of the Vocal Practice and Performance” (PhD diss., Columbia University, 2014), 1-6. <22> See Raymond Knapp, The American Musical and the Formation of National Identity (Princeton and Oxford: Princeton University Press, 2005). <23> During the 2008 campaign McCain responded to critics who derided his love of ABBA with the following remarks: “If there is anything I am lacking in, I’ve got to tell you, it is taste in music and art and other great things in life. I’ve got to say that a lot of my taste in music stopped about the time I impacted a surface-to-air missile with my own airplane and never caught up again.” See Peter Hamby, “McCain Rises to ABBA’s Defense,” CNN Political Ticker (blog), CNN, August 15, 2008, http://politicalticker.blogs.cnn.com/2008/08/15/mccain-rises-to-abbas-defense. <24> See for example All Things Considered, “Music Picks from Obama, McCain,” NPR, August 12, 2008, https://www.npr.org/templates/story/story.php?storyId=93540755.